Driving an RV takes an immense amount of skill and you’ve proven that you have it. However, our 7" Ultimate Wireless RV Trailer Backup Camera System License Plate with Side Cameras offers an extra layer of protection, so you can cruise the open roads with ease. Simply mount this 7” LCD monitor to your windshield or dashboard and plug it into your cigarette lighter or another power source. Enjoy the ability to connect up to four cameras at once, or mix and match with gaming systems and DVD players. Installing the license plate camera is just as simple, Just screw your RV license plate through its brackets and you’re done! There is absolutely no drilling required for RV owners to worry about. The side mirrors even offer swivel mounts, allowing drivers to adjust their angle according to the parameters of their vehicle. See everything around your RV in the clearest possible quality. Equipped with full color and auto night vision, his CCD is the finest camera we have to offer. And don’t worry about incurring damage, as both the camera and the mount are made of steel, ensuring they’ll stay safe in any type of condition. • Enjoy the unique ability to connect a DVD player and gaming systems. 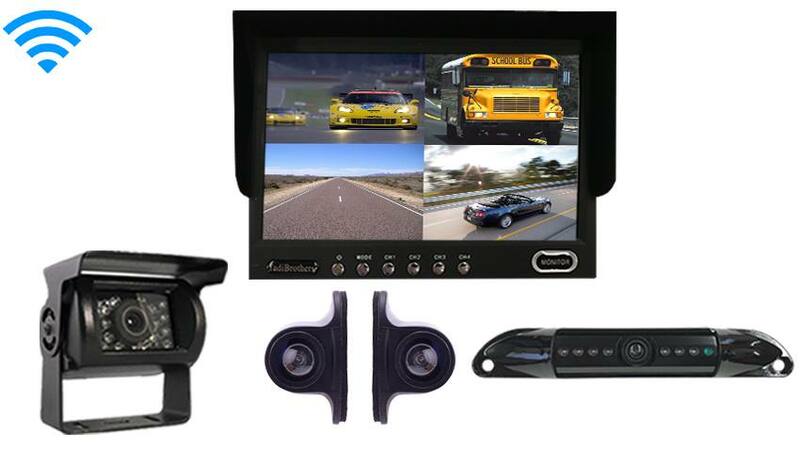 • The Monitor is compatible with all of our cameras and works in any vehicle. • Easy to install both LCD monitor and cameras. • 7" Ultimate Wireless RV Trailer Backup Camera System License Plate and Side Cameras provides assurance when driving. • 95-foot viewing range allows you to anticipate upcoming road conditions. • Night vision and full color ensure that drivers won’t miss any visual details when it comes to their surroundings, whether day or night, rain or shine. By using the “CUSTOMIZE AND UPGRADE” section at the top right of the page, you can choose which style of backup camera fits your needs and budget. This system comes preconfigured with 3-5 cameras however, we have different styles for all kinds of uses. Choose which configuration best fitsyour budget. The License Plate backup camera is mounted by screwing your current license plate screws through its brackets; it’s a very simple installation. The camera can also be adjusted by angling the camera up or down so you can get the perfect view for your car. The CCD lens is the clearest and highest quality camera TadiBrothers sells. This wireless camera has a 95ft range that can go through any vehicle. Also, This system, like most of our vehicular products that have an LCD screen, can be used for video gaming, Considering that a perk or bonus for purchasing our back up system (others block that feature). The wireless side camera has a 120° Degree viewable angle, its waterproof and has auto night vision. The side camera is perfect for any long RV or Bus. You can mount it on the side facing front or back any see everything in crystal clear quality. You need help parking? This is for you! You need help changing lanes on the freeway? This is a must! The wireless RV Box camera Has a 120° Degree viewable angle, its waterproof and has auto night vision. The camera is one of the most durable we have, with incredible adjustability and night vision clarity. The RV Box camera has a metal sun shield visor to protect you from glare and pebbles. This is by far our toughest built camera. It has been regularly used in cars, vans, buses and even industrial sized caterpillar trucks, operated in the harsh oil sand of Canada. This camera can take a direct hit from a rock and it will still work like new. It has also been very popular with RVs, because its housing allows you to install the cameras on multiple sides of your RV.